I visited Boogie's Burgers (a local burger joint that has been in operations since 1969) last night for the first time around 8pm thinking that I would've arrived past their dinner rush, but I was wrong. When we ordered, the girl who worked there informed us that the wait time would be roughly half an hour and asked if we were okay with that. We said yes since we weren't in a hurry. It was a Monday night, but it was also the Victoria Day long weekend Monday, so I'm unsure if that was a influencing factor in the long wait. I must admit that Boogie's Burger looks somewhat sketchy, though I am not sure if that is just a play into their retro/old school image. Inside, there are round bar stools at the front, a number of diner-like tables that can probably sit up to ~20 people or so. In the already cramped up restaurant, there was a old school arcade machine that could be found. We decided to take a seat up in the front, on the bar stools, and one thing I noticed right away was that there was a hung string, with many tiny report clips, above the cash register that ran to the back of the kitchen by the grill. All orders printed were then clipped onto the report clips and flung back by the employee so that the orders would reach the grill where the cook was making the burgers. I thought this design was so cool - simple, old fashioned, but works as it's supposed to. 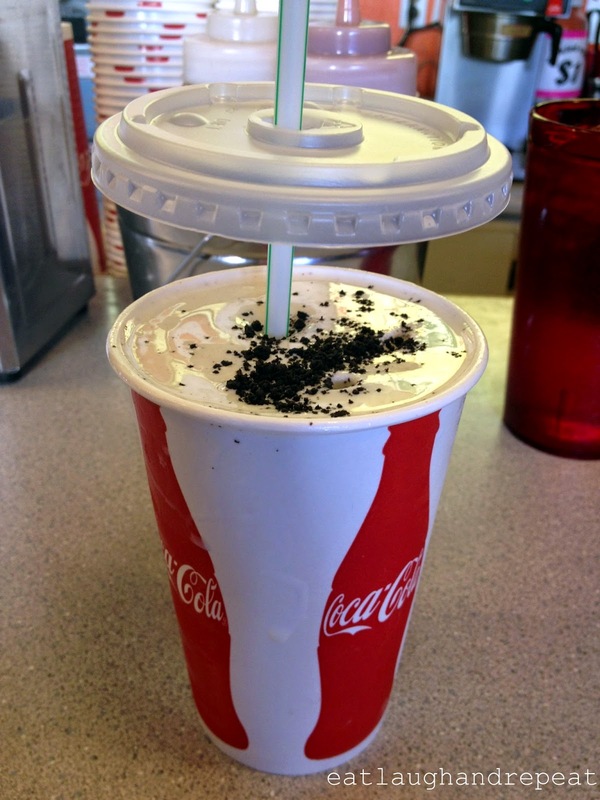 I ordered a medium oreo milkshake to share (experience has taught me that when eating at a burger-specialized restaurant to go easy on the drinks). I'm undecided if it was because I was really hungry by this point or that it was what it was, but the milkshake was really good. It wasn't thick and unbearable like other milkshakes I had tried before - you know those milkshakes where it's almost impossible to get the first sip moving through the straw. This milkshake was smooth and creamy, all the while having the right thickness. The amount of oreo was also perfect as it wasn't too sweet. The only thing I didn't like was that the medium was quite small for its size, but the large was way too big. 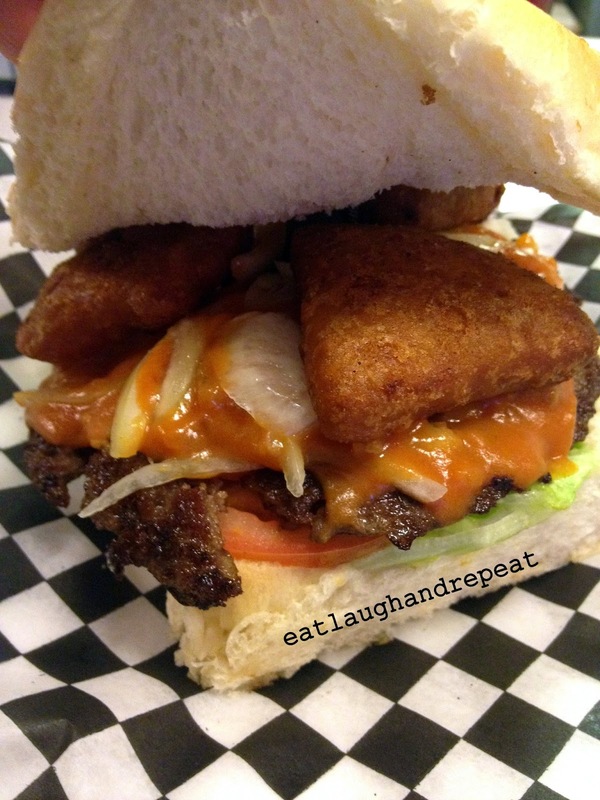 I ordered the Deep Fried Mac 'n Cheese Burger (one patty, cheddar, deep fried mac 'n cheese wedges, Boogie's signature red sauce, lettuce, tomato and onion). This was heaven when it arrived after having to wait for 30 minutes. This satisfied both my cheese and beef patty craving, creating the perfect combination for me. The deep fried mac 'n cheese wedges were not spewing out cheese, nor was it the runny type of cheese, so the cheese didn't overtake the whole burger. The wedges were fried to a slight crisp, adding a little something different to the burger. 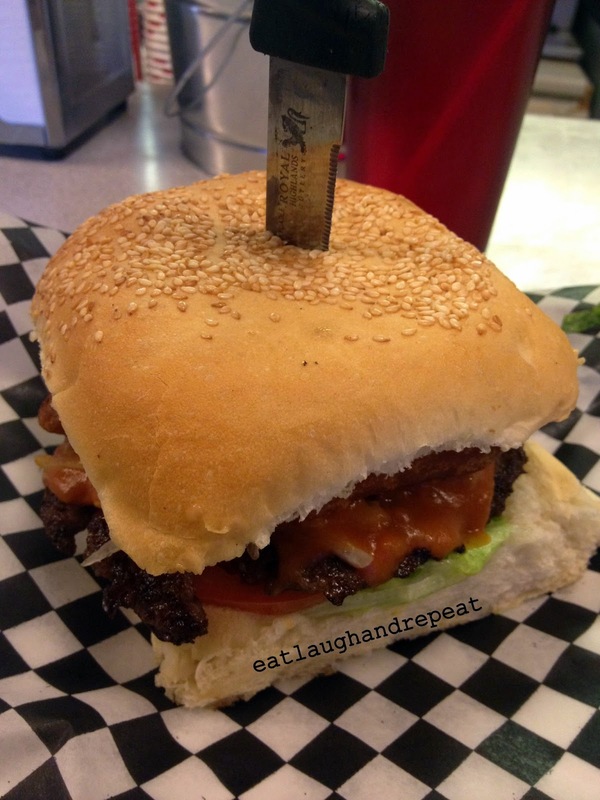 An additional plus to this already delicious burger was that the sesame buns were heated up. My food partner of the night ordered the Blazin' Saddles (Two patties, cheddar, fried mushrooms, fried onions, spicy bbq sauce, lettuce and tomato). Initially, he was slightly scared off by the three level of spiciness, named 'it's got heat', that the burger had garnered. But he decided to go through with it and in the end, he didn't find it to be too spicy to handle. He thought the burger was delicious, which I'm sure it was, but I didn't think anything stood out in the burger, except for the spicy sauce. We also ordered a small spicy fries and yam fries to share, but unfortunately I was too busy chowing down my yummy food to take a picture. The yam fries were a bit soggy, whereas the spicy fries had more crispiness to it. A side note that I want to mention is that about ~15 minutes of having sat down, Boogie's Burgers had run out of the sesame buns that is ordered fresh to the store every morning. This was told to all the new customers that had walked through the door, and although disappointed, this was quickly changed when the employee offered a voucher for a free burger the next time they visit. I found this to be a wise management action, because it not only turns an upset customer into an happy one, but it ensures that they will return. From this, you can tell that Boogie's Burgers really care about their customers and appreciates every single one of their business. 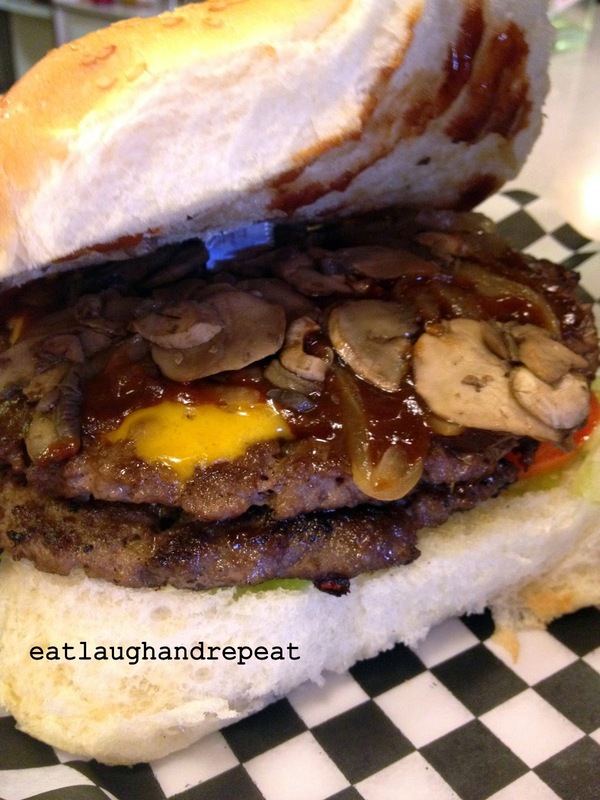 Over the past few years, Calgary's burger scene has grown exponentially, whether it be locally owned or an American franchise. It has become a interest of mine to try out all of these burger fast food restaurants, and although it might not be a goal to do so every time I get a chance to eat out, I do keep in mind of all the burger-specialized restaurants that I have gotten a chance to eat at. Boogie's Burgers falls under one of my favourites, but the only thing that may deter me from visiting frequently would be their pricing. It is quite expensive for in the end, it is "just" burgers and fries. On the other hand, I would love to visit more often to support this local burger restaurant so it can sustain and grow in the many years to come.